Even the chaos seems perfectly planned. The mom with the “oh well, kids will be kids” look on her face while the room is a mess. Or the mom, perfectly pushing a stroller, with smiling children while sipping a latte. (I can’t even push a stroller and sip, trust me my stroller has the stains to prove it). Or the one with the beautifully made dinner and the clean counters and the kitchen table that isn’t piled high with last weeks school papers. Yeah, I’ll never be that mom. I used to think that the second time around I would be that mom. The one with the picture-perfect life. The one with the right diaper bag, hell even the one who didn’t regularly forget her diaper bag. The mom who wasn’t always forgetting the sippy cup or the mom who managed to lose the baby weight and look great doing it. The mom with the right jeans and the right shirt and the kids with the combed hair and nails that she hadn’t forgotten to cut, again. And it was painfully clear yesterday. I had to get both kids to 2 different schools. One on the bus and ten minutes later one to a school 8 minutes away. Timing was key. And I had grand plans of actually working outside my house. So I had taken the time to fix my hair, put on a decent outfit and even throw on some shoes that weren’t sneakers. I packed my laptop, and the bags of the two small people whose lives I organize and headed out the door, feeling like I had it all together. Until I got to the car and realized I didn’t have my keys. And then my grocery delivery showed up and the driver was confused about where to put the bags since I opened the garage the moment she pulled up. So, with the baby under one arm and bags in hand, I ran back in the house in desperate search for my keys, which were nowhere to be found. A glance at my watch showed I had about 5 seconds to either find my keys or run for the bus, I choose run. The groceries were sitting in the driveway and the garage door wouldn’t close. I shouted for Jack to start running, I threw Grace in the stroller, dropped the bags and ran. So if you had glanced down my street yesterday you would not have seen an Instagram moment. You would have seen an out of shape woman running in wedge boots down the street shouting at her child to keep running. I broke a damn sweat. But we made the bus. And I’m pretty sure the mom who drives to the bus stop was laughing at me. And as I walked home I knew I would never be that picture perfect mom. 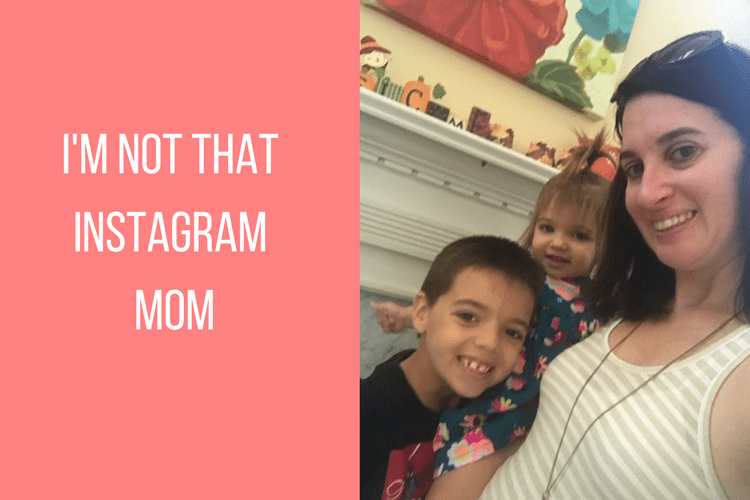 I would never be the mom of effortless Instagram posts, or the mom who’s diaper bag isn’t overflowing with toys but lacking in diapers or the mom who manages to do it all with a smile on her face. My counters will always be cluttered. My stroller always a little messy and my style more relaxed than the runway. I’ll never have it all together or even pretend too. But I can push the clutter aside, pour a glass of wine and laugh about it because I’m sure your life isn’t all that Instagram worthy either.